This exciting series debuts in print as a supplement in our coming edition. The idea was born last summer when I interviewed a delegation of African mayors, and escorted them on a tour of Vancouver, Canada, where the UN 3rd World Urban Forum was in full swing. That stimulating, week-long experience set the stage for success. Our 2007 Great Cities of Africa spotlight shines on Calabar, Nigeria, proud host of ATA's 10th Ecotourism Symposium - Abuja, Nigeria's Capital, Addis Ababa, Ethiopia, site of our 32nd World Congress, and Kampala, Uganda, home of the 4th Africa Peace Through Tourism Conference. In "A Tale of Two Cities" - our editors and candid camera profile cities in various countries we have visited recently. Examples are Yaounde and Douala, Accra and Kumasi, Cape Town and Jo'burg, Nairobi and Mombasa, Lusaka and Livingstone, Arusha and Dar es Salaam, Casablanca and Marrakech. Get the picture? 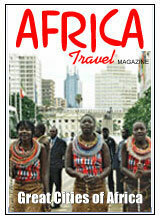 Each city's airport will be profiled in "Air Highways to Africa, another Africa Travel Magazine supplement. Please visit our award winning, Google-friendly website. Search from over 3,500 pages on Africa travel, trade, transportation, hospitality and tourism. Learn how our media team can be your reliable long-range partner on the marketing scene. If you would like to get involved in our Great Cities of Africa Essay Contest or to be interviewed with comments on your favorite African city, please e-mail africa@dowco.com and we will send you a form.  33 African cities have hosted our association since 1975 - and each will be profiled in this popular, ongoing series of magazine supplements and DVD presentations.